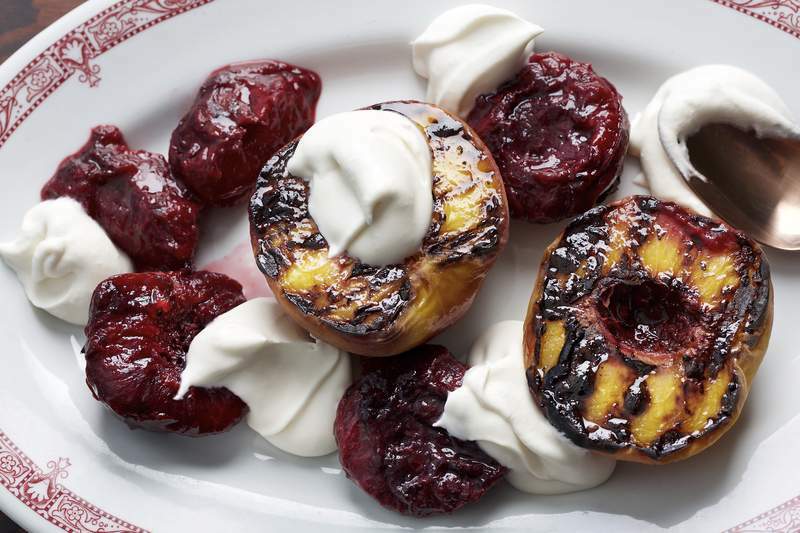 Deb Lindsey | Washington Post Charred Stone Fruit with Bay Leaf Cream brings a smoke and wood flavor to dessert. • Don't flame out. A stove-top or oven is a more stable environment than open flame for practicing with char. If you try fire, wait for the wood to burn into glowing coals. Then pull the coals to the side and cook directly over them. Use only coals that are fully red: Coals with black sections aren't ready yet; they're likely to flame up. • Keep it dry. Although you can toss the food in a little oil, chefs recommend keeping the cooking surface dry. A dry surface can reach a higher temperature without smoking or burning a cooking oil. Oil on the surface of the food will quickly bond and cook along with the hot food, rather than smoking with the skillet or griddle. Chefs say cast iron is the best surface for getting the high heat you need for charring. • Don't move the food around. Recipes have conditioned us to think that food needs to be cooked for an even time on each side, but this isn't true for developing char. Proper technique means leaving the food longer on the first side, letting it release its natural juices and develop a tasty crust. Resist the temptation to shake the pan or turn the food before it's ready. • Wait for the sweat. So, when is that food ready to flip? Start checking it when it starts “sweating.” As vegetables cook, they release their natural moisture. That moisture creates a barrier between the food and the cooking surface. The food will then release easily. If you find yourself prying food up with a spatula, it's not ready yet. - Stay focused. Food can go from charred to burned in a heartbeat, so don't get distracted. Jeremiah Langhorne bends over a small coal bed in front of the log-stacked firebox in the kitchen at the Dabney restaurant. As he fans them, the coals redden and shoot out sparks. The 1,000-degree heat from deep within the firebox lashes out with angry blasts, but the chef's glasses don't fog, and his bearded face betrays only a light misting of sweat. He reaches in, barehanded, to spread some baby vegetables in a wire basket set on the coals, and keeps fanning. What Langhorne is going for is a good char. Char, often confused with burn, is the dark edge on a cube of roasted butternut squash, that deep brown bubble on your pizza crust and the dark crosshatch marks on your perfectly grilled steak. Char is a trending flavor enhancer at restaurants and in processed foods, but home cooks often end up burning foods instead. Food scientists agree that the line between char and burn is pretty fuzzy. “The difference is in intensity, not in the type of process that is happening,” says Bruno Xavier, processing authority at Cornell's Food Venture Center. Xavier explains that burning is a combustion reaction that requires oxygen. But, chemically speaking, char is formed by heating organic matter without the presence of oxygen, in a process known as pyrolysis. Meats, vegetables, even fruits can be charred (although medical experts warn that charred meats can be linked to cancer). We don't cook in a vacuum, so getting a decent char in the kitchen is about good heat management even in the presence of oxygen. Think about the cut surface of an onion sitting in a cast-iron skillet, bathed in a steady heat transfer. A pan of carrots in the oven roasts in a closed environment, with no airflow. But an onion on a grill is sitting over open fire, feeding on oxygen, and quick to burn. Combine the cream, sugar and bay leaf over medium heat; as soon as the mixture starts to bubble at the edges, remove from heat. Cool to room temperature, then discard the bay leaf. Wash the fruit, cut in half and remove the pits. Do not peel. Heat a dry cast-iron skillet or grill pan on high heat. Place the halved fruit, cut sides down, on the hot surface. Cook for 3 to 5 minutes, until you see the fruit begin to release moisture. Lift carefully to check the char level – it should be dark brown, not black. Remove each piece as soon as it is done. Meanwhile, pour the bay-infused cream into a mixing bowl; whisk just long enough to form soft peaks. Arrange the fruit on a plate, cut sides up. Sprinkle fruit with a pinch of the flaky salt, if using, and drizzle with a small amount of oil. Add generous dollops of the softly whipped cream. Serve warm. Makes 4 servings. – Adapted from Trevor Knotts, corporate chef of the Richmond Restaurant Group. In a fire box, flat grill, or large, flat fire pit, build a hardwood fire. Let it burn until you have a good bed of all-red coals – you'll need a pile large enough to fit under a wire grilling basket. Meanwhile, sort the vegetables into three piles: Firm root vegetables (carrot, parsnip, potato, winter squash, turnip); medium-firm (bok choy root, bell peppers, fennel, celery); and leafy greens (kale, chard, bok choy tops). In a medium-sized bowl, toss each set of vegetables with the olive oil; remove and set aside. Rake the coals away from the fire into a small pile. Fan them to remove ash. Set a wire grilling basket atop the coals to preheat it (the wire will start to glow red in the center). Add the firm vegetables, spreading them evenly in the basket. Watch the vegetables closely, fanning the coals occasionally, until they begin to release moisture. Remove the basket and turn the vegetables with tongs, checking for tenderness and browning. Before they are done, slide the firmer vegetables to the side of the basket, and add the medium-firm vegetables, spreading them out. Fan the coals occasionally and watch for them to release moisture. When they begin to sweat, turn them and add the leafy greens. Briefly cook the leafy vegetables (some will darken and turn crisp). When they are wilted, remove the basket from the coals. Toss the vegetables with a splash more olive oil, freshly squeezed lemon juice, sesame seeds, Aleppo pepper, and salt to taste. Garnish with fresh herbs. Serve warm. Makes 2 servings. – Adapted from Jeremiah Langhorne, chef at The Dabney in Washington, D.C.
Heat a large, ovenproof saute pan over medium-high heat. Add the oil and swirl to coat. Add the carrots, spreading them evenly, but do not stir. Cook for several minutes, stirring only once after you see the carrots begin to release moisture. A few minutes later stir again, looking for good caramelization on the carrots. Add the butter, salt, pepper, thyme and rosemary. Toss to incorporate; cook for 1 to 2 minutes – just long enough to blend the flavors. Transfer the pan to the oven; roast for about 25 minutes, until the carrots are tender. Serve hot, or at room temperature. Makes 8 servings. – Adapted from recipe developer and former chef Eric Lindquist.